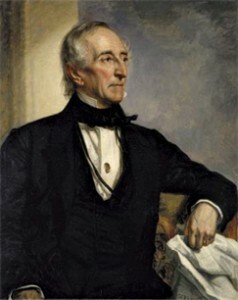 One of the most astounding facts about John Tyler, Jr., the 10th President of the United States, is that as of the summer of 2009, two of his grandchildren are still living. One of his sons, Lyon Gardiner Tyler, was born in 1853 when the former president was 63. Lyon Gardiner Tyler, in turn, fathered a son at 71 (Lyon Gardiner Tyler, Jr.) and another (Harrison Ruffin Tyler) at 75, both of whom are still with us today. The fact that President Tyler had 15 children in all with his two wives during his lifetime makes you wonder how many White House Christmas cards might have been sent out by the family during his years in office. Indeed, one may wonder how many Christmas cards exchanged between all the family members of the Tyler family survived over all this time. The answer to the White House Christmas cards mystery is probably “none,” since not only is there no information whatsoever as to whether the Tyler family followed that present-day Christmas tradition, but it was not until 1843 – during the middle of the Tyler administration – that the first commercial Christmas cards were even commissioned. That card was quite controversial as it showed a family and their young child partaking of some wine drinking, a picture of which would have been scandalous had the Tylers sent out something similar as their White House Christmas cards. Although Christmas cards were not exchanged, it is known that President Tyler enjoyed hosting Christmas parties for young children. Sarcastically dubbed by the press as “His Accidency” because of his rise to the highest office of our country following the death of William Henry Harrison who had served just one month, John Tyler was a man who established many precedents. In addition to becoming the first to assume the presidency upon the death of a predecessor, he was also the first unelected president, the first to be married while in office, the youngest ever to become president, the man who fathered more children than any other who had served as president, and the first president whose wife died in the White House. In addition, he was the only one who believed that he was not a U.S. citizen at his death in 1862, having died in his home state of Virginia as a citizen of the Confederacy (since the United States never had legally recognized the existence of the Confederacy, in the eyes of the Union he was still an American citizen). John Tyler was fond of all his children and threw lavish affairs for them. 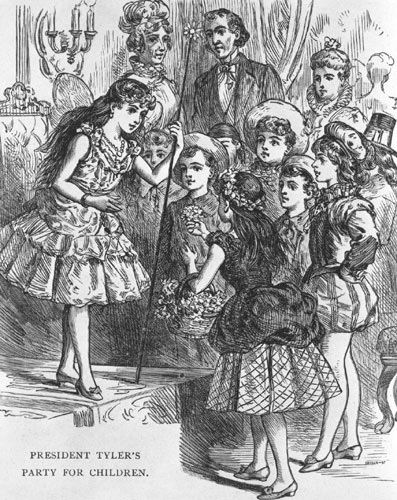 This illustration depicts a children's party, possibly a Christmas celebration, thrown by President Tyler. A lawyer by trade, John Tyler, Jr. was born in 1790 in Charles County, Virginia to John and Mary Armistead Tyler. John, Jr. seemed destined for a career in law and politics. His father, who served as Virginia governor from 1808 to 1811, became his law tutor following young John’s graduation from the College of William and Mary in 1807 and his admittance to the bar two years later. Entering politics, Tyler at the young age of 21 was elected to the Virginia House of Delegates, serving for four years. He then served on the Virginia Council of State; in the U.S. House of Representatives; like his father, as governor (1825-1827); and in the U.S. Senate (1827-1836). Certainly, had the sending of Christmas cards been a custom at that time, the lack of communication between Tyler and his family, who were in Virginia, could have been avoided! During those years, he stood out as a strict interpreter of the Constitution as well as a staunch backer of states’ rights, a belief which propelled the Democrat to associate himself with those of the newly-formed Whig party, men such as Daniel Webster and Henry Clay. Although the Whigs were too weak to put up a strong run in the 1836 election, the Depression in the mid to late-1830s that gripped the country gave the party a chance to capture the White House in the next election in 1840. In order to provide much-needed support from states in the South, the Whigs nominated their new member, Tyler, to run as the vice presidential candidate along with their nominee for president, Harrison. Avoiding major issues and running under a slogan of “Tippecanoe and Tyler too” (Tippecanoe was the name of the river in Indiana where Harrison had defeated the Shawnee Indians years before), Harrison and his running mate were successful in their quest to occupy the highest offices in the land. However, following an almost two-hour inaugural speech delivered in frigid weather conditions, President Harrison soon after developed pneumonia, dying exactly 30 days after he took office. If sending out White House Christmas cards had been something practiced by the Tylers, how interesting might it have been to see just how few would actually have been needed considering the lack of political friends he had during his administration! Amid all the political bashing, good-natured Tyler’s personal life was not tranquil either. Married to wife Letitia since 1813, by 1839 she had become an invalid. After her husband acceded to the presidency, a daughter-in-law, Priscilla Cooper, became the President’s official hostess since the First Lady was not able to perform her official duties. On September 10, 1842, after a lengthy illness, Letitia died. 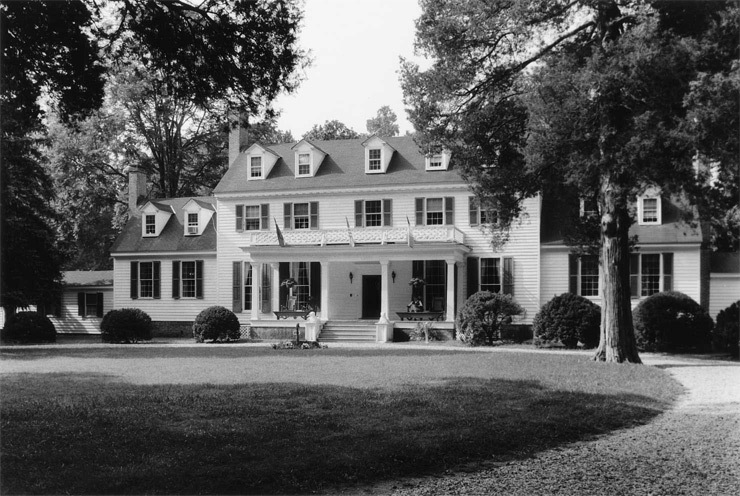 John Tyler retired from politics in 1845 to his Virginia plantation, Sherwood Forest, where he would spend many Christmas holidays with his family before his death in 1862. During the following year, the widower Tyler had taken notice of an outgoing and quite beautiful young woman named Julia Gardiner, daughter of Senator Daniel Gardiner of New York, whose family usually spent the winter social season in Washington. It was a special White House Christmas that followed as the President hosted a special Christmas Eve gathering of the Tyler and the Gardiner families. Two months later, as the families were enjoying an excursion down the Potomac River on the gunboat, Princeton, one of the guns accidentally fired, killing Julia’s father. Hearing the explosion, Julia fainted into the arms of the President. Their friendship turned into love in the succeeding months and the two were married on June 26, 1844. Serving as First Lady for only a little more than eight months until the end of her husband’s term, Julia made quite an impact during her short reign. At the age of 24 and 30 years younger than her husband, she was the youngest woman to serve as First Lady. Bringing gaiety and a youthful feel to the White House, she made sure that the song “Hail to the Chief” was played at state occasions and she also introduced the Waltz and Polka to White House dance festivities. The one Christmas Julia spent as White House hostess must have been one of joy and celebration, even without the sending of White House Christmas cards! Although President Tyler’s administration was less successful than his new wife’s effect on the social scene, there were some aspects of his administration which can be considered positives – the territory of Florida became a state during his reign. He was a proponent of the annexation of Texas, which three days before the end of his term was signed into law. He also began the process of annexing Hawaii. As for foreign affairs, he can be credited with the strengthening of trade relations between the United States and China. John Tyler was a man who looked younger than his years. The fact that Julia was young enough to be his daughter must have helped keep him youthful. He did, however, suffer from poor health during much of his adult life, especially as he aged. 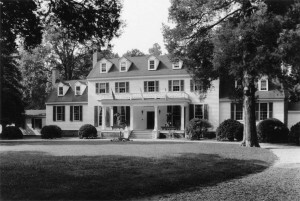 After the end of his presidency in 1845, he retired to his Virginia plantation, Sherwood Forest (so-named because he felt he had been “outlawed” by the Whigs), and withdrew from politics, spending time and each year’s Christmas caring for his ever-growing family that he and Julia were blessed with. Just before the Civil War, in February of 1861, Tyler made himself available as a sponsor and chairman of the Virginia Peace Convention, hoping to find a way of avoiding conflict. When President Lincoln remained steadfast against the expansion of slavery, the former president concluded that Virginia’s secession was inevitable. Tyler became instrumental in the formation of the Confederate States of America and was elected to serve as a member of its House. Unfortunately, before he could assume office, he died. John Tyler is buried in Hollywood Cemetery in Richmond. It is amazing not only that 34 presidents have passed between Tyler’s presidency and his two living grandsons, but if one considers that since Tyler was born during the administration of George Washington, it is a truism that three generations of Tylers have lived during the reign of every single president of the United States! In fact, grandson Harrison Tyler still resides at the Sherwood Forest Plantation, which spans over 300 feet and contains the longest wood-framed house in the United States. If you are inclined, you can send Harrison a Christmas card to the plantation’s address at 14501 John Tyler Memorial Hwy in Charles City, Virginia 23030. Amazingly, as of January 2012, both of President Tyler’s grandsons are still with us. Lyon Gardiner Tyler, Jr. is 88, and his brother, Harrison Ruffin Tyler, is 84. Harrison, who still is in charge of maintaining President Tyler’s home, is of the opinion that former presidential candidate Newt Gingrich is a “big jerk”, thereby proving that he is a senior citizen who still has complete control of his faculties. As I write this (4-20-2015), the grandsons are still living. Amazing!